Historians have a standard story about the partition of Poland in the 18th century: Poland was unable to defend itself effectively because it had a crazy unanimity rule that gave every nobleman a veto over everything. Seems plausible. And yet this government lasted, in this form, more than two centuries; embracing the period of Poland’s greatest power and renown. And then I suddenly remembered the scores of neat maps I’ve seen with super-sized Polands, like this 1648 beauty. It is true her government was finally subverted, and the people subjugated, in consequence of the extreme to which the principle was carried; not, however, because of its tendency to dissolution from weakness, but from the facility it afforded to powerful and unscrupulous neighbors to control, by their intrigues, the election of her kings. But the fact, that a government, in which the principle was carried to the utmost extreme, not only existed, but existed for so long a period, in great power and splendor, is proof conclusive both of its practicability and its compatibility with the power and permanency of government. Interesting. I’ve been thinking lately that we need an amendment stating that no law which authorizes the use of force against any citizen shall be passed without a two thirds majority. This would, in my opinion, reduce the quantity and complexity of legislation, stop the back and forth of laws which change every time the party in power changes, reduce partisan bickering as only a very convincing argument would have any hope of becoming law, and last but not least, enhance the protection of minority interests. There is one case in which it might be worth going as far as the Poles, that of declaring war or authorizing the use of force in international affairs. Here I think a 90 or 95 percent approval should be reqired. The public is fickle. We have no right to ask soldiers to risk their lives for a mission that we feel free to change our minds about. No commitment – no war. Calhoun was a brilliant man. It’s such a same that much of his work has been dismissed because he took the wrong side on the slavery debate. Well, it is widely accepted among historians that it was this liberum veto that underlay the defeat and partition of Poland at the end of the 18th century. It should be kept in mind that there are a lot of Poles, a fact again on peoples’ minds since they have entered the EU, where they are one of the “big countries,” along with Germany, France, UK, Italy, and Spain, more in population than all the other transition countries that joined with them together. That they could not maintain an independent state is a pretty strong sign that something was badly off, and pretty much everybody agrees it was this liberum veto. I’d say that the liberum veto was not a great idea, but a much bigger problem for the Poles was the lack of defensible borders. That they have survived at all is a testament to their character. Perhaps it is a mistake to underestimate the value of their belief in themselves as a free people. With such veto power, wouldn’t the resulting society almost have to become anarcho-capitalist? With such an easy way to get dissent (bribe any one of the legislators) I would think that it would be difficult for any law at all to be passed. Which would result in the government essentially doing nothing. Is the eventual fall of poland demonstration of the inability of anarcho-capitalism to provide for the common defense? mjh, no you would have to compare it to a state that lasted longer. It lasted about as long as the United States, and it wasn’t actually anarcho-capitalist (I don’t think that would have lasted as long). I would think the fall of Poland no more demonstrates the “inability of anarcho-capitalism to provide for the common defense” than the fall of France in 1940 demonstrates the inability of the state to provide for the common defense. Or the fall of Rome. Or of Babylon. Or of any of the myriad empires, states, principalities, republics, etc. that have fallen through time immemorial. By what logic does the state get to take a pass on all these disasters, but anarcho-capitalism is “refuted” from one example? On the primary point, the triolgy of the great Polish novelist, Henryk Sienkiewicz is surprisingly instructive. The three novels (titled in the Hippocrene Books edition “With Fire & Sword,” “The Deluge,” and “Fire in the Steppe”) detail the troubles in Poland in the mid-17th century when it was beset by a gruesome Cossack rebellion aided by a Tartar invasion, simultaneous invasion by Sweden, Russia and the Cossacks, and then invasion by the Ottomans. The undercurrent in the stories is Sienkiewicz’s desire to re-awaken Polish nationalism (they were written in the late 19th century). The end of the trilogy shows Jan Sobieski stepping to the forefront (he has not been elected king yet) to save Poland from the Ottoman threat, and of course the reader is supposed to know that it was this same Sobieski, as King, who raised the seige of Vienna in 1685, one of the greatest feats of Polish military history. But Sienkiewicz tells the story better than he knows, I think. For the troubles begin in the first book with the Cossack rebellion which is quite clearly provoked by unscrupulous Polish nobility who are trying to manipulate their way into more complete control of the monarchy, so that it can be used to centralize power on their behalf. Then in the second book, the resiliency of the Commonwealth’s institutions is amply demonstrated by the gentry’s initially accepting the Swedish invasion with an attitude of “it doesn’t matter who’s king” (consistent with their republican outlook) and then rising against and throwing out Charles Gustav as soon as it becomes clear that he means to tyrannize them. (The celebrated events surrounding the icon, “Our Lady of Czestokowa” date from this conflict.) In this story too, it is a Lithuanian nobleman who has dreams of holding consolidated power who is the enabler of Swedish conquest, while the Polish King, Stephen, who has no standing army or centralized power to turn to, triumphs by embodying the soul of the Polish people and nation. What I’m saying is that though it seems to me Sienkiewicz may have been seduced by the idea of a Polish “state” like the other states of Europe, if only one could come into being, (and I’m not certain he was) his story tells a different lesson, because it is the independence of the Polish gentry and the de-centralization of their commonwealth that gives it the resiliency to survive three massive wars in a period of less than 10 years. I know it’s “only a novel,” but I think it’s instructive nevertheless. By the way, it’s no argument to say that most historians blame the liberum veto, because their wisdom is precisely what is in question. Besides, most modern historians are statist to the core, and cannot wrap their minds around a polity that does not fit the paradigm of the modern state. In 1505 the gentry forced King Alexander (reigned 1501–6) to recognize the legislative power of the Sejm, or diet, … The liberum veto, which allowed any representative to dissolve the Sejm and even to annul its previous decisions, was applied with growing recklessness in the 17th and 18th cent. The Polish kings had always been elective in theory, but in practice the choice had usually fallen on the incumbent representatives of the ruling dynasty. After the death (1572) of Sigismund II, last of the Jagiellos, the theory that the entire nobility could take part in the royal elections was newly guaranteed. John II (1648–68) reign came to be known in Polish history as the “Deluge.” During his rule discontent in Ukraine flared in the rebellion of the Cossacks under Bohdan Chmielnicki. In 1655, Charles X of Sweden overran Poland, while Czar Alexis of Russia attacked from the east. Inspired by their heroic defense of the monastery at Czstochowa, the Poles managed to regroup and to save the country from complete dismemberment. The Peace of Oliva (1660) cost Poland considerable territory (including N Livonia), and by the Treaty of Andrusov (1667) E Ukraine passed to Russia. The Vasa dynasty ended with the death of John II. John III (John Sobieski; reigned 1674–96), who defended (1683) Vienna from the Ottoman Turk invaders, temporarily restored the prestige of Poland, but with his death Poland virtually ceased to be an independent country. After John III, the fate of Poland was determined with increasing cynicism by its three powerful neighbors—Russia, Prussia, and Austria. Fearing that all Poland might fall into Russian hands, Frederick II (Prussia) proposed (1772) a partition plan to Catherine II, which later in the same year was modified to include Austria. 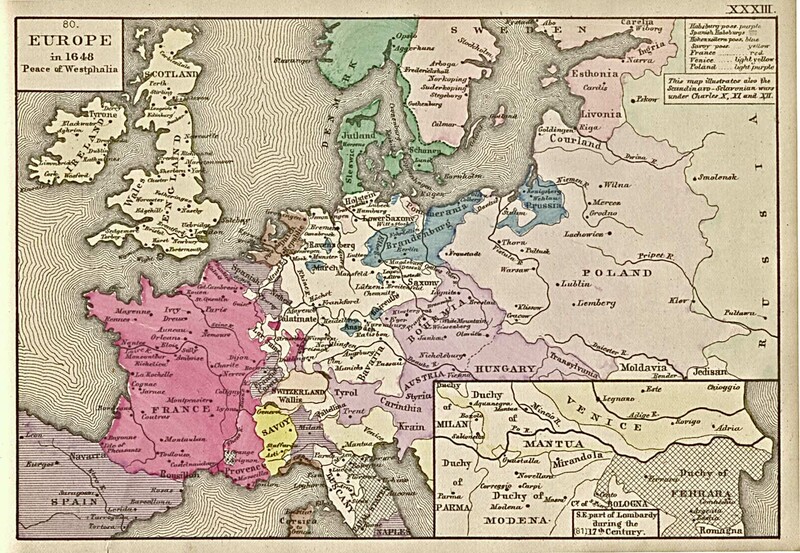 Three successive partitions (1772, 1793, 1795) resulted in the disappearance (1795) of Poland from the map of Europe. The King could stand a paralyzed parliament because Poland was not a modern bureaucratic state. The country, however, could not stand the subversion of the electoral process that unanimity required. Poland went from greatness to its Deluge in 76 years, a single lifetime. And from thence to being removed from the map in less than 200 years. The process of dissolution would have been faster but for the good geographic luck of being located at the intersection of 3 growing empires, Prussia, Austria and Russia. This meant that for a long time, if one empire made a move against Poland, two others propped it up. Further, France, the richest and strongest continental power of the age, was also motivated to intervene to keep Prussia and Austria at bay. When France weakened, the empires finally conspired and that was the end of Poland. The US Federal Government was designed with just those problems in mind. Accepting Calhoun’s theory would have meant the eventual dissolution of the Federal union, and potentially the partition of the US by European powers. Fortunately, the North won the Civil War.